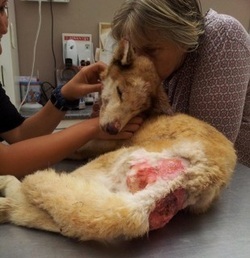 Husky Rescue would like to share this horrific story with you. The story of Emily and her brave fight to stay alive. 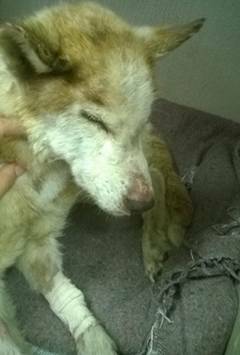 We received a call on Sunday 9.2.14 that a stray husky was found in Lenasia and we were asked to assist. Abi offered to collect the husky that would become Emily. I believe you will be hearing from her for a very long time. Below is a step by step account as it happened and the story has just started. The first photo of Emily and her start to recovery. Emily just arrived at the Vet who opened specially for her. TEAM EMILY UPDATE: Joanne Van Nierkerk and Abigail Strachan have just been to visit Emily and some good news: she is sitting up and actually snapped at the vet so she is stronger but these are early days. Her test for distemper and tick bite fever came back negative. 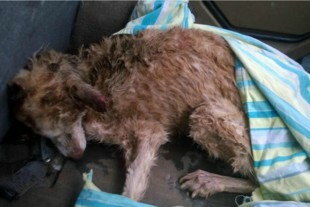 There are still maggots dying everywhere and she still is weak and in a serious condition. Thank you for all the support!! Emily showing some life for the first time. Bailee would like to know if Emily gets a biscuit after her blood operation...Emily, you have a 4.5 year old praying for you, along with the rest of us. Stay strong, fight hard!! We love you baby girl! I guess some people would think Bari’s over exposed, seeing such cruelty at her age, personally, I think she’s learning the value of life, and compassion for animals, you’re never too young to learn wrong from right. TEAM EMILY UPDATE: I just received this pic from Joanne Van Niekerk and the tears are streaming down my face again. This little fighter managed to stand on her own for about 3 seconds. Whoooooooooo Whoooooooooo!! When Joanne stopped stroking her beautiful face she lifted her head up as if to say 'don't stop'. She polished off her chicken in record time but still has a loose stool. The prognosis is still guarded and the road to recovery will be a long one but I know she will pull through! TEAM EMILY UPDATE: Look at this tender moment shared with Ian Jones! Emily is a little stronger today but you can see she is tired. She is still on the drips and the vet is testing for biliary daily. All the other tests are looking slightly better. She is eating very well and especially chicken which is her favourite. Keep praying for this fighter! All I can say wow, I was not prepared for this, I cried and am still crying. Sorry about the graphic picture but that is a reality. I just wish there was more we could do but there isn’t, she is receiving the best possible care. Now we just have to wait and pray. I think she has the will to live I just hope her body doesn’t give up on her. Please Emily fight hard little girl we ALL need you to pull through. TEAM EMILY UPDATE: I have excellent news on our famous little patient! 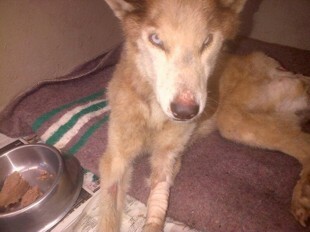 Emily is doing well, is standing and turning in circles in her crate. This morning she was able to eat dry kibble and her biliary test came back negative once again. Bloods also looking a lot better and the vet will be doing a faecal count to see what other worm infestations she is fighting. HAPPY DANCE TODAY! TEAM EMILY UPDATE: We have had some bad news....Her biliary test came back positive. 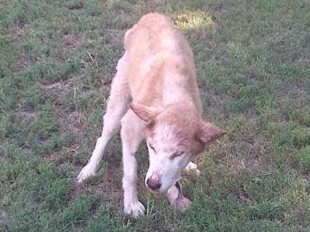 She has been treated for it, and continues to eat well and respond, and is looking brighter every day. Her chances of survival at this point are 50/50, so I’m begging you all too please continue praying and thinking of Emily, and sending her all the healing energy that you have. She is a fighter and she can do it, with our help. I sat with her for a long time, talking and cuddling, she even lifted her back leg for a belly rub and pawed me every time the tickles stopped. Emily, my baby girl, my hope, I’m counting on you. Keep going, keep fighting, I love you baby girl, so so much. Although Emily is looking better she is still in the danger zone. Thank you all for your continued support! FOD- Emily’s story is not unique, this is the kind of situation that all Breed Rescue’s and shelters encounter on a daily basis. 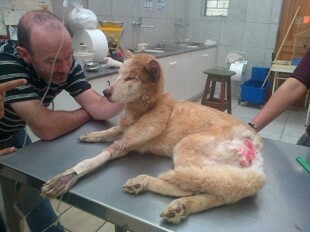 Please support them as much as you can, and if you would like to keep up to date with what is happening with Emily, please just visit HRSA website at www.huskyrescue.co.za. 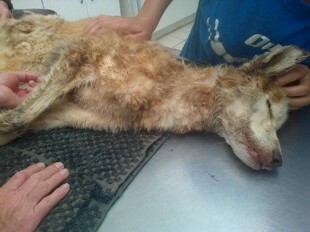 I am sure that they would appreciate any assistance you can give – Emily’s vet bills are going to be enormous.